Carnival Corp shuffled executives at the top of the UK Corporate structure, moving up two key people and adding another to fill the empty office. Carnival Corp announced this morning that David Dingle will move up from CEO of Carnival UK to become the chairman of Carnival UK. At the same time David Noyes is being promoted from executive vice president of operations to fill the CEO position. He will have operating responsibility for the UK-based P&O and Cunard brands. Fincantieri cut the first steel today at their Marghera yard for Viking Sea which is the second ship they are building for Viking Ocean Cruises. 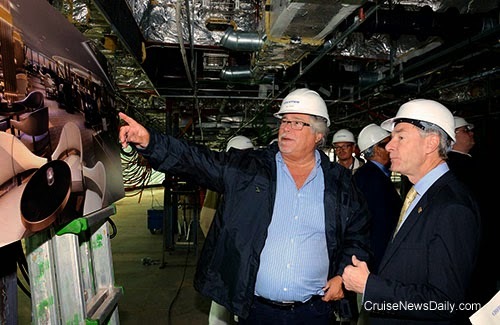 Most cruise passengers have never been to the naming of a new ship. Many may have seen the ceremony and the breaking of the bottle on the internet, but it is even more exciting in person. Some passengers aboard TUI’s Mein Schiff 4's maiden cruise will have the opportunity to attend the ship’s naming - for a price. Bermuda has taught Nassau a valuable lesson. 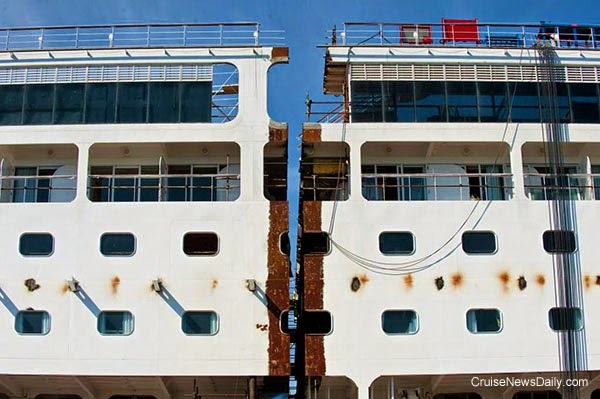 There’s easy money to be made from tourists who come on cruise ships. A number of them will have drugs, and if you arrest them, you can fine them hundreds of dollars which they will readily pay rather than face a jail term. These types of arrests seem to be on the rise in Nassau with four American tourists from cruise ships arrested over the weekend and in court on Monday. Altogether, fines of $1,500 were collected. Two of the men arrested together had just a gram of marijuana between them. CND subscribers also read about what was going on at another shipyard ... and the relationship with Southampton. MSC Armonia is now more than 24 meters longer than when it arrived at the Fincantieri shipyard in Palermo (Italy) at the end of last month. 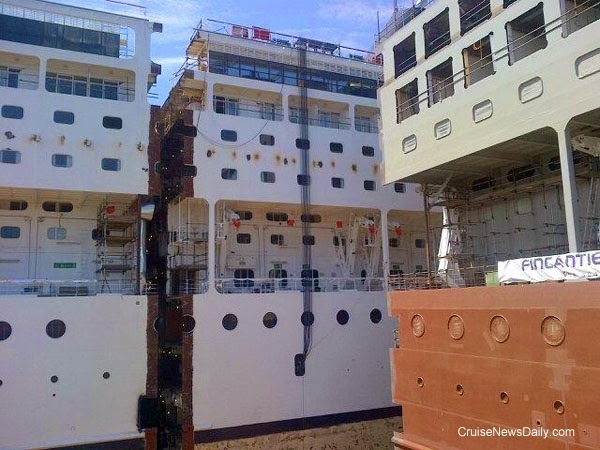 As part of MSC Cruises' Renaissance Project, the ship is being lengthened by way of inserting a 24-meter section in the middle. The cutting completed on Monday, it was pulled apart today on the rails in the dry dock, and the new midsection will be in place tomorrow. These photos show the incision and the new section ready to be inserted. The time lapse video below shows today's whole process. For perspective on the size, note the people walking on the bottom of the dry dock. 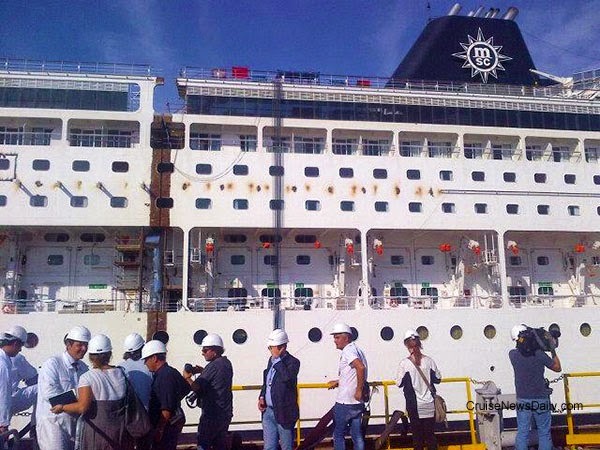 Photos courtesy of MSC Crociere. Video courtesy of Matt Sparke. All rights reserved. May not be copied or used without permission. is part of an ongoing series of key moments in Cunard Line's history. White Star Line had been using Southampton since 1907 and had an office there. 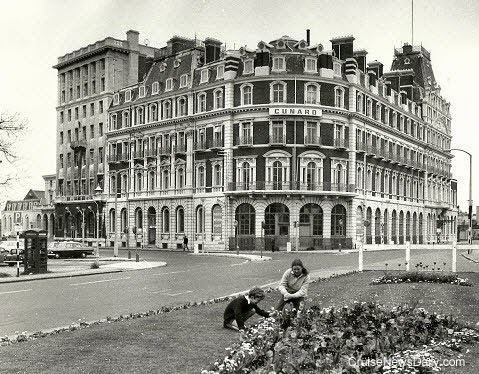 Cunard made occasional calls before World War One; but after that Cunard found it politic to operate its express liner service from Southampton and, in 1919, an office was established at Maritime Chambers. 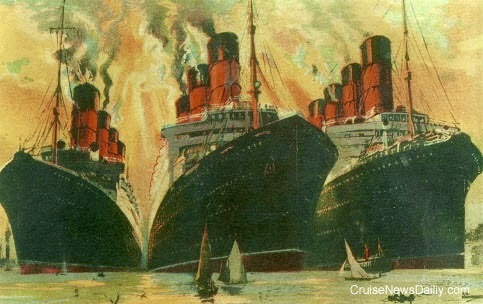 Soon Cunard's “Big Three,” Mauretania, Aquitania and Berengaria, were running from Southampton to New York via Cherbourg, with the first Cunarder to use the port being Aquitania. However, Mauretania inaugurated the new service on 18 November 1919. 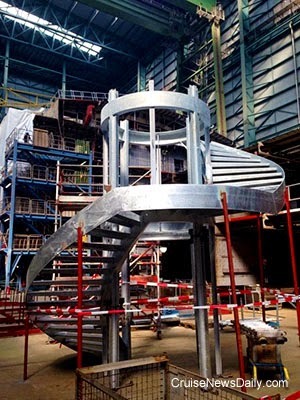 It's only six weeks until Meyer Werft delivers Quantum of the Seas to Royal Caribbean, and as you can see on the video below, the push is on to complete the details and get the ship away from the outfitting pier and out on sea trials. The yard is planning for that by the end of the month. When Celebrity’s Millennium-class ships were built, they were powered by state-of-the-art gas turbines. A few years ago, as the price of gas rose dramatically, they became expensive to operate, and as regular readers will remember, through an engineering miracle, they were able to install a diesel engine (which was much more economical to operate) and leave the gas turbines in place. Celebrity is glad they did. Constellation’s diesel engine has broken, and it needs a large component replaced. In the mean time, it is operating with its “spare” gas turbine, meaning itineraries are not being affected. CND subscribers also read about a little feathered R&R ... and Father's little dividend. A naturalist released a bird from the stern of Carnival Miracle. 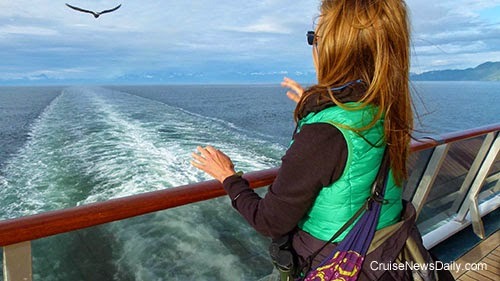 Photo courtesy of Carnival Cruise Lines. All rights reserved. May not be copied or used without permission. 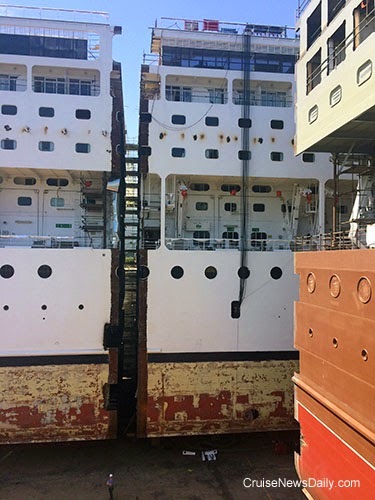 The day that a cruise ship starts its engines for the first time in the yard is a big deal because they generate the electricity for the ship so from that time on, they are seldom ever all completely shut down. CND subscribers also read about a Princess bus overturning ... earning more than $3,300 per minute ... and Australia exploding. P&O's Britannia started its four engines for the first time today at the Fincantieri yard at Monfalcone (Italy). Chosen to start the giant engines was Formula One race commentator Suzi Perry. one of the engines she started. At 141,000 tons, Britannia is the largest cruise ship ever built for the British market. Britannia will enter service for P&O from Southampton on March 14, 2015. Photos courtesy of James Morgan and P&O Cruises. All rights reserved. May not be copied or used without permission. Geneva, 8 September. On Thursday 4 September, MSC Cruises was awarded the Swisscom Business Award, an award dedicated to the most pioneering ICT project in Switzerland and presented by Swisscom. MSC Cruises was rewarded for its innovative approach in the project around its managed contact centre solution (MCCS). “MSC is an impressive testimony to how technology and innovation can be used to intensify customer relationships,” said chairman of the judging panel Thomas Wirth. Some 80 companies submitted entries for this year's Swisscom Business Award. The awards are in recognition of Swiss companies and institutions that have implemented groundbreaking ICT solutions. Manor AG, Universitätsspital Basel (Basel University Hospital), Schwyzer Kantonalbank, MSC Cruises, Loeb AG and Fondazione Ticino Cuore (Ticino Heart Foundation) all made it to the final. A judging panel made of specialists evaluated the solutions submitted by the finalists according to the criteria of business benefit, degree of innovation, technology and sustainability. The above-mentioned jury had thoroughly studied the finalists’ contributions before deciding that MSC Cruises emerged as the winner. To improve and intensify its direct contact with clients, the company merged its contact centres in eleven global locations into a single cloud-managed solution. As the explanation for the panel's decision to grant the Swisscom Business Award to MSC Cruises, Thomas Wirth commented, “MSC has created an entirely new sales arm for new regional markets that complements its existing channels. We were impressed by the added value generated by MSC's cross-border managed contact centre solution.” 300 agents across Europe are already advising customers via the new platform. 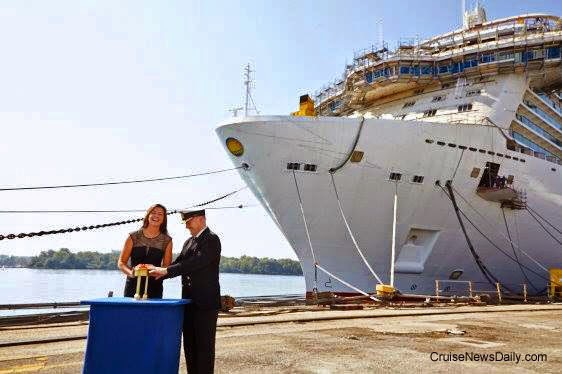 It enables the company to cater to the needs of future and potential guests over a longer time span, starting from the research stage through the booking process to the time prior to, during and after a cruise. With the centralised telephone communications platform, MSC lays the foundation for implementing its corporate strategy. The focus here, alongside real-time control of the eleven European contact centres, is on strengthening direct customer contact and, above all, on enhancing a continuous and innovative customer experience. Seattle, Wash., Sep. 8, 2014 – Holland America Line has promoted Christine Thurlow to director of national accounts sales, North America, on the company’s National Accounts Sales team. Thurlow will report to Charles J. Dunwoody, CTC, senior director, national accounts, North America. In addition to her Canadian portfolio, she will take on Holland America Line and Seabourn sales responsibilities for Virtuoso, Signature Travel Network, Costco, Our Vacation Center, Expedia and Travelocity. During Thurlow’s time as the manager of national accounts for Canada, her achievements included receiving the Outstanding Achievement Award for Sales 2011 and being named Cruise Supplier of the Year for Travelsavers Canada 2011, CAA Cruise Supplier of the Year from 2006 through 2010 and Cruise Partner of Year from the Ensemble Travel Group from 2006 through 2013. Thurlow holds a Bachelor of Arts in geography with a major in tourism from the University of Calgary. She lives in Vancouver, British Columbia, Canada.